My friend Molly emailed this happy news a few days ago: “My beans all popped up under the Reemay, yours must have too.” Yes, mine did too. Whew! We’d both planted bean seeds in less than ideal conditions, cool soil and forecasts for rain, but we’d covered the rows with Reemay, gambling as gardeners often do that this floating row cover would provide the warmth needed to make the seeds germinate instead of rot. We won! And now sturdy seedlings have shouldered up through the soil, ready to start adding leaves whenever the weather really warms up. Germination was so good I’ll even have to do some thinning. 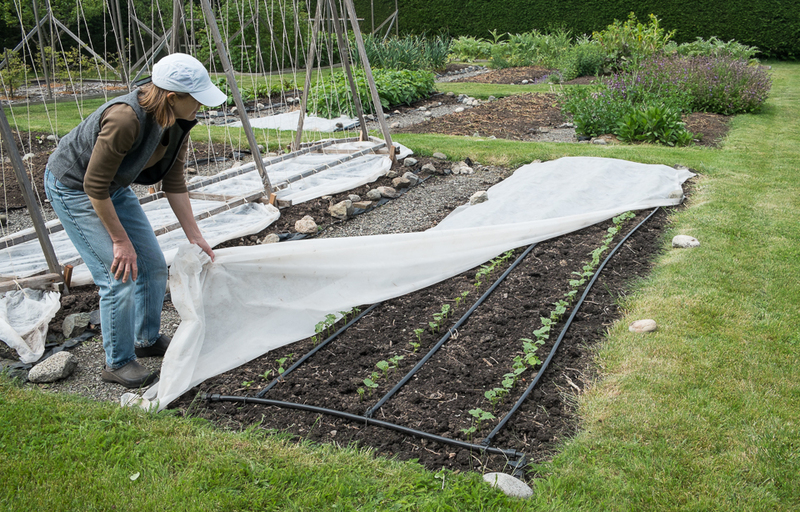 Reemay is the brand name of the original floating row cover, a lightweight spun polyester fabric gardeners can spread out over newly seeded beds or drape over transplants or growing plants and then secure with rocks or soil. Agribon is another brand available today. Reemay is typically about six feet wide and is sold on rolls of 20, 50 or 250 feet. The six-foot width is perfect for my five-by-eighteen foot garden beds because the additional width gives plants room to grow up under the cover. I buy a 250-foot roll and cut off eighteen-foot lengths for a whole bed and shorter lengths for sections of beds. Each piece lasts at least three seasons before beginning to break down, so a 250-foot roll lasts me for years. I’ve bought it at Stueber Distributing Company in Snohomish, Washington. Territorial Seeds also sells it mail order as do many other seed and garden supply companies. Row covers also come in lighter and heavier weights though I haven’t tried either yet. During this past rainy week, as we anxiously monitored our bean rows, Molly and I both periodically slipped our hands under the Reemay to see how much warmer the soil felt. 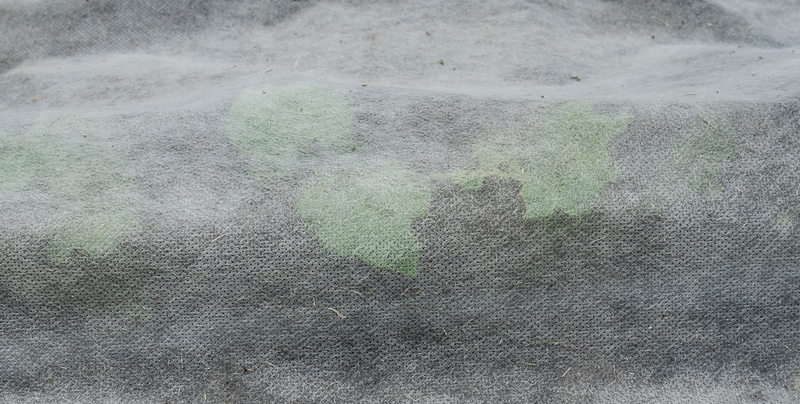 Even on a cloudy day, the soil under the row cover felt decidedly warmer than soil exposed to the air. On the few sunny days, the covered soil was almost hot. Row covers let rain through so the soil stayed moist but they also let light through and trap and hold heat, the key to our germination success. While we use Reemay to warm the soil for seed germination and also use it to protect early spring and fall/winter crops from cold and frost, it has another valuable use in the garden: as a barrier to bugs, birds and cats. I use it over carrots to prevent carrot rust fly, over beets and chard to prevent leaf miner, over turnips and cabbages to prevent root maggot. I’ll often leave it on carrots, beets and spring turnips until harvest and on cabbage crops until the plants are well enough established to withstand bugs. If the days get really hot, I’ll loosen the row cover or even remove it temporarily but our cool marine climate rarely makes this necessary. 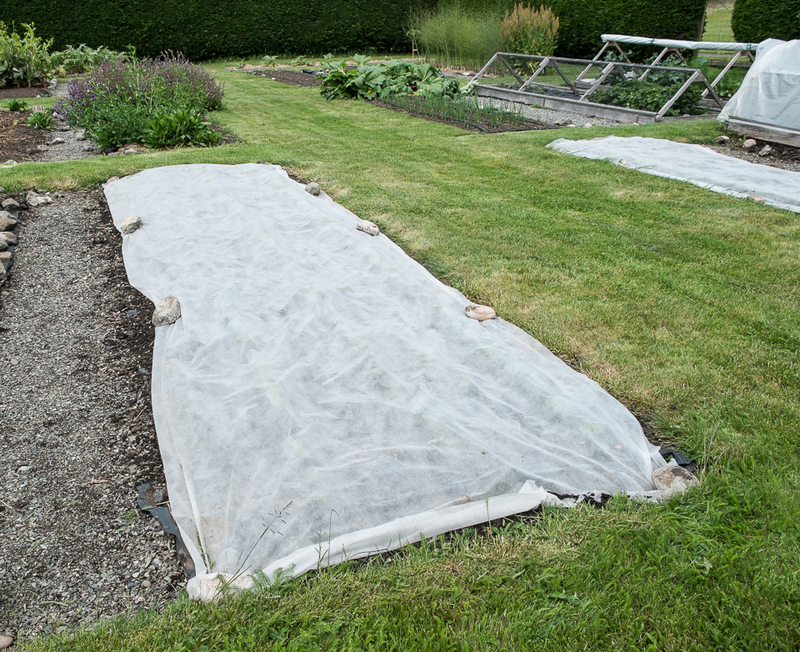 Row covers also prevent birds from pulling up newly sprouted seeds and cats from using the garden bed as a giant cat box. As any photo of my garden reveals, there’s always Reemay covering something somewhere. It looks a bit ghostly, but I don’t think I could garden without it. In the next few days, I’ll be planting beans, corn and squash in the kitchen garden. I’m a bit behind my usual schedule because I’ve been traveling for the past three weeks, but I left the garden beds ready for planting so all I need now is a sunny day and, though this may be asking too much, some weeks of warm weather to speed germination and growth. Beans, corn and squash, the three-sister trio often associated with Native American gardens, have always been part of my kitchen garden. Though I’ve never attempted the Native American planting strategy of seeding corn in the center of a mound, surrounding it with beans that climb the corn stalks and finally surrounding these two with squash whose rambling vines encompass their sisters, I do take advantage of the synergy among these three vegetables both in the garden and in the kitchen. 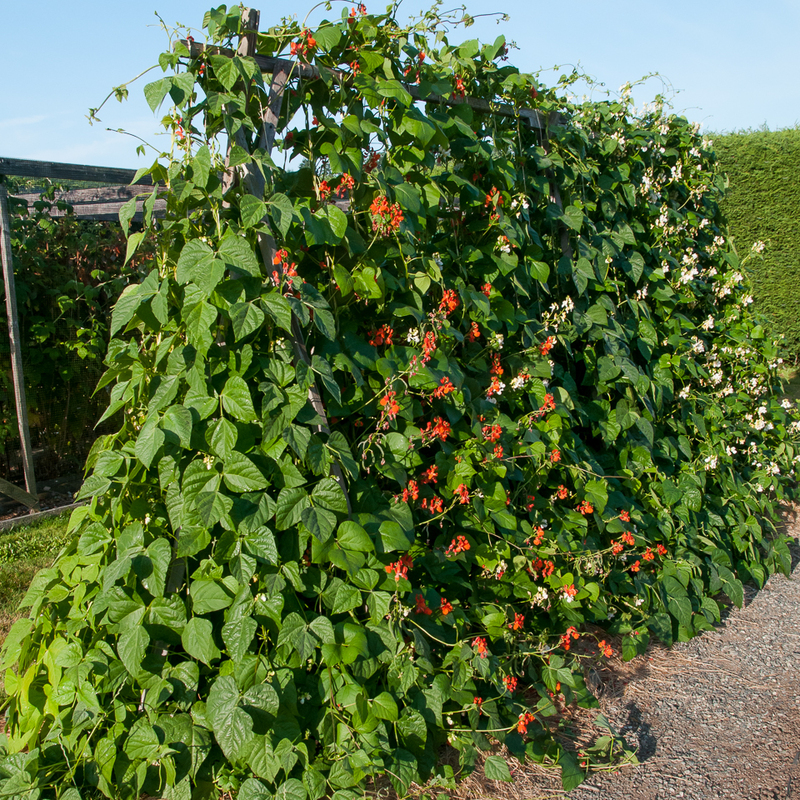 In my rectangular garden beds, I plant pole beans in one bed beneath a trellis of strings for climbing, corn in two adjacent beds, two rows per bed creating a block of four rows to encourage good pollination, and squash in one or two beds that give lots of space to vine and spread. 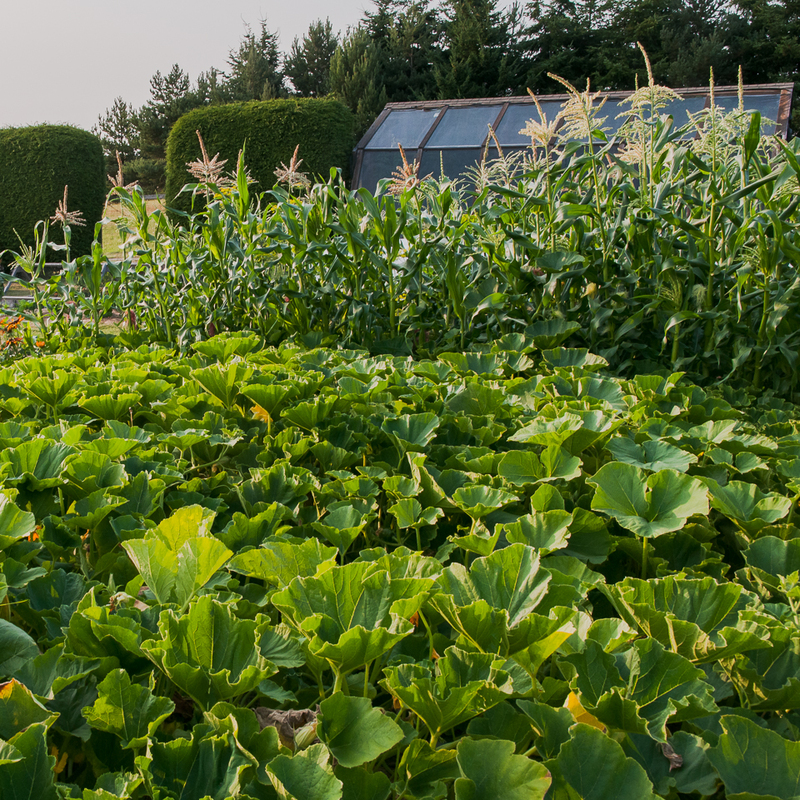 This year’s corn goes into the beds that held nitrogen-producing shell beans last year, an important rotation for healthy corn; pole beans go into a bed that next year can use the nitrogen beans provide; and squash goes into beds where its robust growth won’t overwhelm other vegetables. Planting it next to corn beds where it can wander beneath the stalks is perfect. The seeds in these photos are three favorites: Seneca Horizon corn, Sunset runner beans and Burgess Buttercup winter squash. 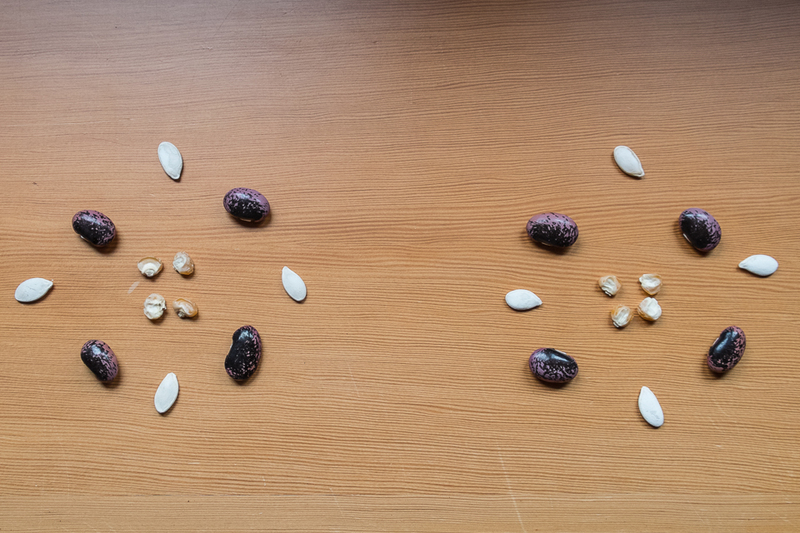 Three months from now, with very little work on my part, these small seeds will be massive plants. Soon after that I’ll be harvesting the first corn and shell beans and, later, squash and dried beans. Beans, corn and squash are complementary sisters in the garden and they join together just as wonderfully in the kitchen. Fresh succotash is only a dream at this point in the garden season but when it’s finally a reality, around the end of August, I’ll eat it every day at first. 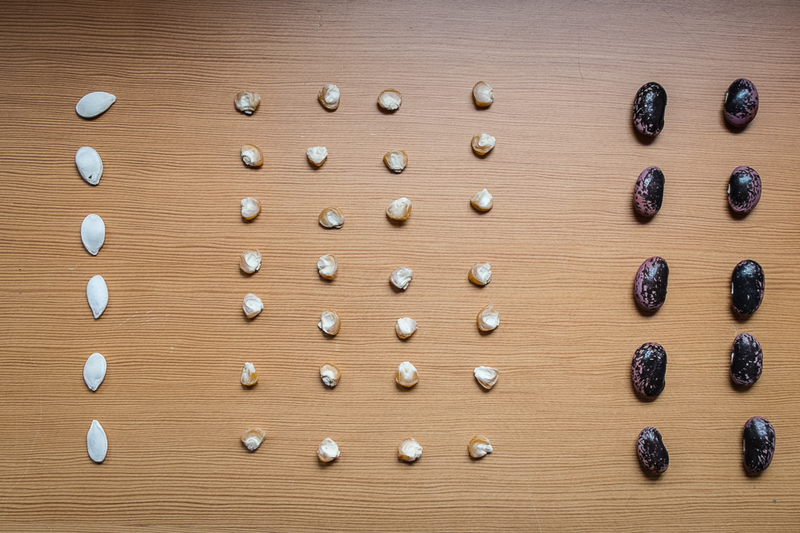 Maybe it tastes so good because together corn and beans form a complete protein, but on my tongue the goodness comes from flavors and textures, slightly crunchy sweet corn and soft, rich beans. By late autumn, the winter squash will be ready to join corn that I’ve frozen and dried beans I’ll rehydrate in soups and stews, traditional three sisters meals that carry us through the winter. But I get ahead of myself. It’s spring and time to plant seeds.